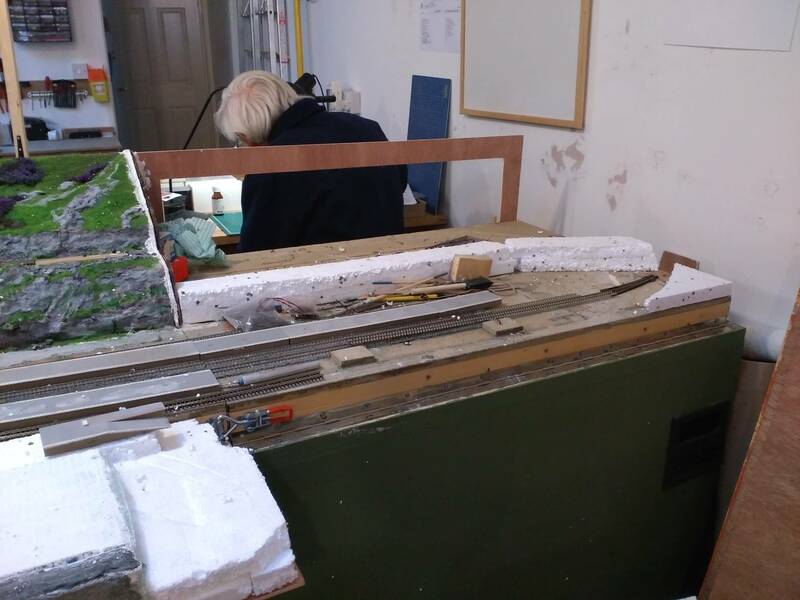 Today board 6 was started, a 1200mm by 600mm piece of extruded polystyrene was cut, timber inserts glued into the corners and the 10in back scene board glued on the back. It's all now sitting weighted down to set for the week till I can continue. meanwhile the kilt is hanging on the door, ready to be put on for a party tonight.. I did take the gadget down to take some pictures, but by the time I had glued some fencing in place and propped that up. Then fitted the first platform glued that in place and weighed it down. You couldn't see much of what I'd been doing. Addition to that I repaired one of the inserts that hide the hinges. Then made an alteration to board two, so it looks like when they built the station a road was diverted. One thing I've forgotten to fit was a cattle grid, very common they are in the highlands. 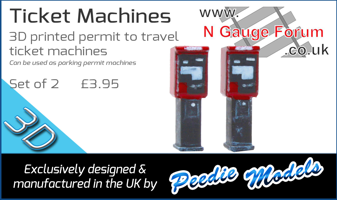 I've not seen an N gauge model of one, so I need to look at some pictures and work out how to model it. It's looking more like I'll need a 2ft wide traverser, that transports separately.. and bolts between two boards at 45degrees..
Today was one of those days where a little bit of work suddenly brought the look of the board together. All I did was lay a thin layer of polyfilla down across the vehicle side of the goods yard. Cover that with ballast well tamped down then cover that with a thin grey paint PVA mix. This covered several changes to the yard. 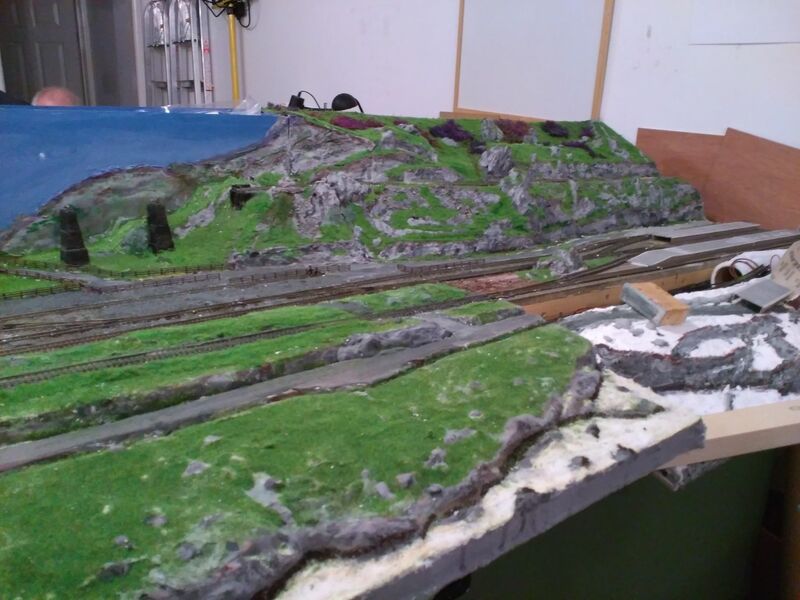 Make some wire and post fencing for the front and back of the layout. Hoover up excess ballast from the above work. I need some gates for the yard entrance I forgot to order them..
Oh I took a couple of photos, I'll post them tomorrow when processed..
Oops I forgot to post the photos last week. This week no direct news from the layout, as I'm in Scotland for a family funeral. However I've been further considering the fiddle yard , a traverser it will be,. 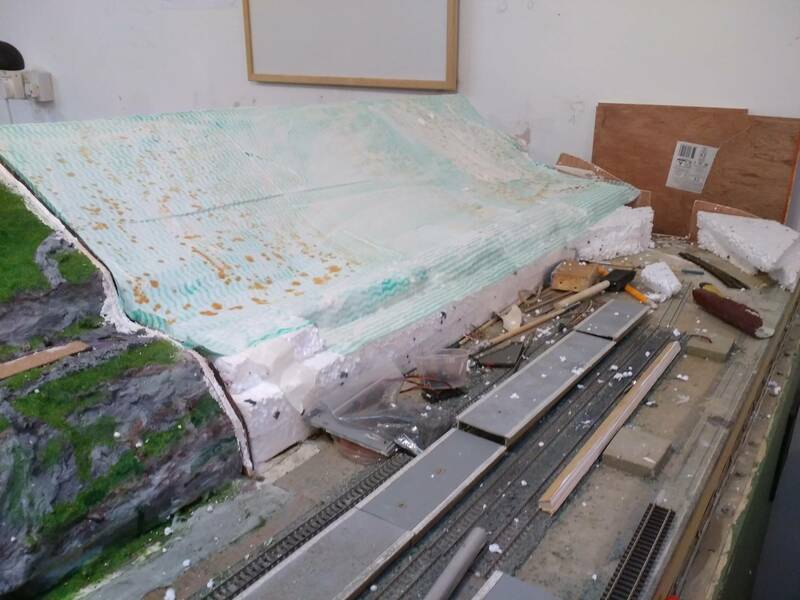 The design caused some problems as it has to be under the hillside of board 6, and within the 2ft of layout carriage width. The design I've come up with has the rollers fitted to the carriage, and the bearing surface on the traverser. By extending the bearing rails so that the traverser can pull almost out of the carriage. I can use the full width of the traverser. Pushing it fully in, the bearing rails should slide under the display side of the layout. I can get just about 3ft in length, and about 1ft width, for the traverser deck. So I think that will give about 7coaches + loco, on maybe 10 tracks. 10mm of 3d printed fencing installed, which doesn't sound alot but that's meant the gates to the goods yard now fit. So post 1923 the bigger companies did take over some lines but started closing many loss making ones..
Post 1948, governments start subsidising lines they want kept open. Many lines close but more slowly. So basically we end up as the same situation as we are now, but with the surviving old companies owning the track as well. So old steam survives while new stock is bought from major manufacturers because it becomes uneconomic to build new at lochgorm. :-The scenery that last weeks fencing was fitted to is removable for transport.. Guess who managed to break it while getting it ready to move. So board 2.which it belongs to is now in the landrover, the bit of scenery is sitting on a very bare board 4. I has hoped take some photos before board 2s departure and before I started on board 4 But the camera software failed on this tablet. I've had to bring it home and reload the software it works now. Board 4 is very bare because I've removed 10points and almost 10yards of track. When I start relaying about 4yards will go back on, but only 2points..
First however, the board needs attaching to the carriage, the hinged front board needs attaching to board 4. Alignment bolts need fitting along with clamps to attach board 3 to it. I've been studying n gauge couplers , my favourite in EM is the dingham couplers, but that's not available in N.. So I'm looking at spratt and winkle or maybe something with bent wire. Rakes of coaches will be permanently attached together so I think I'll fit screw link. For them..
My order of spratt and winkles from wizard models arrived Saturday morning, not bad less than 24 hours after ordering. Since then I've studied the current n gauge version instructions which are slightly different to the version I used 40years + ago in 4mm scale. A couple of victims will have to be selected for trials..
track laying did not commence as the same as last Friday I couldn't find the pack of points... so I cut three pieces of ply, one for the back of board 4. And two matching pieces for the hillside ends of boards 3 and 4. They're not complete yet as I didn't have my jigsaw with me. 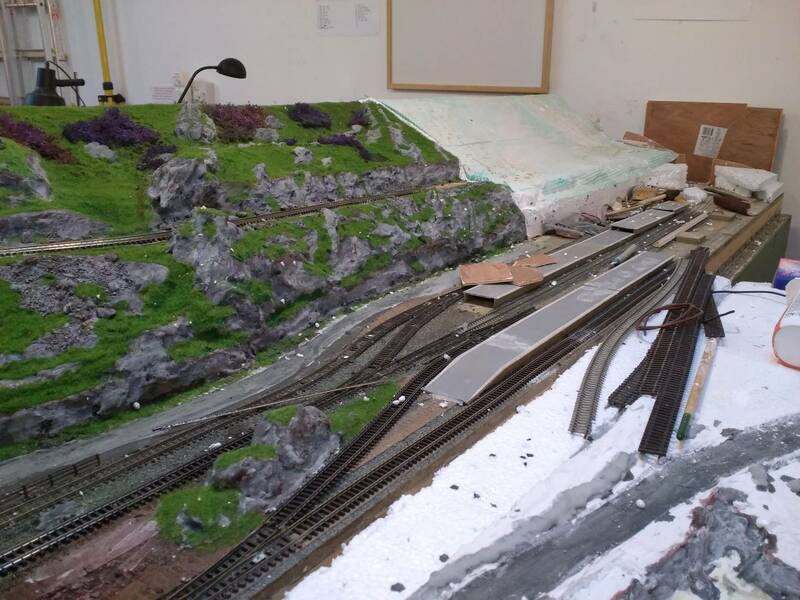 Next week I need to bring polystyrene sheet, the location pins and the platforms, a search party will set out tomorrow. Oh five minutes to pack up I was looking for some stick on Heather and found the track pack.. Didn't find the Heather though.. Problem is I'm a KOS, lifting 3ft of heavy board while lying on your side proved very difficult and painfull .. Much thought has gone on since. Solution, use hinges and pivot the loose board over the top of the fixed board. I just hope the loose boards are shorter than the fixed boards... A trail awaits delivery of the hinges..
Tonight's work, the back board and the end boards between boards 3and 4 were completed , then screwed and glued in place. Two layers of polystyrene were glued and weighted down at the base of the hill side . Decisions have been made on the station size and bridge at one end..
After that I knocked the tool box over blades. And track pins everywhere..
Must take this gadget Next Week more pictures are needed..
A very successful evening at the well attended MRC. First I decided to make and end plate for the as yet in built hill side. Sketched onto a piece of plywood using various known heights and positions . The join the marks as a reasonable looking hillside shape. Jigsawed that out then used it as a TemPlate for the next board. Glued and screwed that into place. The a sheet of expanded metal was cut to size 13inches by 34inches. Down one long side A 1/2.inch was folded over then hung over the backscene board. That was screwed into place and the rest bent and folded into a hillside shape. Two layers of j cloths coated in a mixture of PVA and polyfilla were the applied over the top. The front edges weighted down. This has now been left to set. Next week it will require more reinforcement, then some more polystyrene glued on top in places to form a cutting. As you would expect I'm just back from the MRC, with pictures so you should see them tomorrow. First I made lots of snow, that's is I cut lots of polystyrene up. I needed to make a ramp up between the railway and hillside for road access to the bridge. This was followed by more snow making to produce the cut away hillside for the upper track. Once that was all glued down, the usual mix of filla water and over was applied to j cloths covering it all up and hiding any joins. Then a thick mix was applied to start creating rocks. That all needs to set before I can continue. It's about time I posted them. Much pollyfilling carried out as the second stage of shaping rocks was carried out. 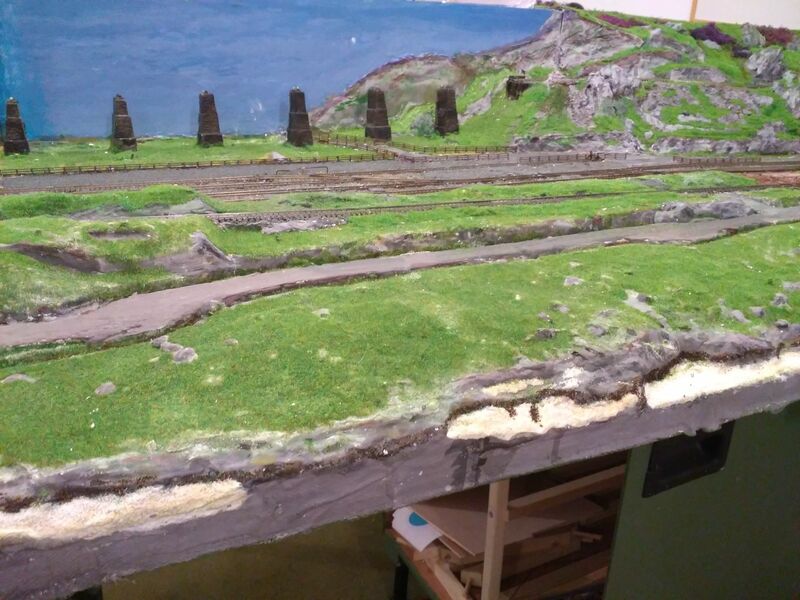 Then the bottle of left over paint which is a grey colour, was deployed so all the rocks were given a initial grey wash.
Two slabs of 1inch foam are weighted down on the board 4 flap. If I remember Next Week I'll take another piano hinge and attach it before some basic rock shaping of the foam. Next week, the above plus green undercoat for the grassed areas, more rock painting.